These new LED lights will take the industry by storm, predicts Nathan Hill. A while back I was ready to jump off the LED bandwagon. I felt far too many were being launched — all with their unique selling points, increased complexity, PC controllability and confusing installation options. Then I got hold of the Kessil A150W and I feel like a born-again LED worshipper. This is everything I want ever from a light and I suspect you will too. They're small and easy to install. If you want to hang them up, great. Get a cable, pop a hole in the ceiling and away you go. However, if you've got an open topped tank, which you'll need if you want to use these lights, then get the bespoke gooseneck fittings, clamp them on to your tank, and feel free to point that light wherever you want: angles, straight down, at the ceiling, whatever. Fire up the light and you're hit with a powerful beam. Don't be swayed by the 150W designation. My kneejerk reaction was to think "150 watts? What the…" However, this is not the case. The light is a 32w densely-populated LED, clustered in one small place and giving the most amazing shimmer through water. It is, however, equivalent in strength to the old 150w metal halides, hence the name. Unlike some LEDs that spread individual diodes far and wide, you don't get that 'multi point source' thing with separately coloured shimmers. You get a genuine white point source of light. The 'W' part pertains to the width of the light spread, in this case just over 140°. Kessil also does a range of 60° spread lights. With a colour temperature of 6,700K, it's aimed at plant growers, though I suspect that until people get to play with them there will be a measure of resistance. Traditionally, LED has been a flat option for planted aquaria. I've seen planted tanks under Kessils and they look bright and vibrant, even promoting red growth. Size is very much a winner here. I've played with many different lights and have burned myself, crushed fingers and dropped heavy units into tanks. 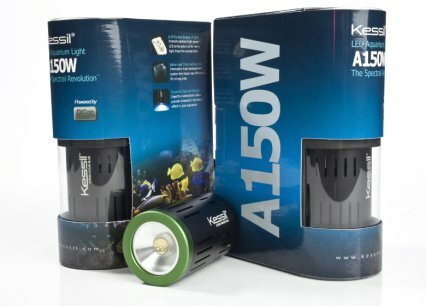 The Kessil lights by comparison are tiny. I can work around them and they certainly don't obstruct any movements. The only negative factor here is the associated noise. These have inbuilt fans that fire up on turning on and they have a high-pitched suction/whirl combination that's quite audible. Output is very respectable. Currently, mine are on a non-aquascaped tank, though my next planted venture is already planned with these. Running mine on a 90cm/3' tank, I'd struggle to adequately illuminate the entire base with one. Two, equally spaced, create all the intensity I need. These will take the industry by storm. In fact, they already have! Retailers are simply rushing to lash these things to their own aquaria. If you're a planted tank fan and thinking of going LED, I'd strongly recommend checking these out. They're a sensible enough price for what you get and they don't put a foot out of step. Simply awesome. Price: £230 — J and K Aquatics will advise as to helping you find your nearest local retailer.